A forensic scientist traces the mysterious disappearance of a French television personality. 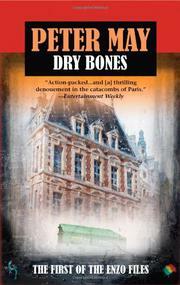 An oblique prologue hints at a dark crime in 1996 Paris. In the present, Scottish biologist Enzo Macleod, who’s worked for law enforcement in his native land, comes to the City of Lights with two goals. His first ends in failure when his estranged daughter Kirsty, now settled in Paris, slams the door in his face because she still hasn’t forgiven him for leaving her mother. Enzo meets with journalist Roger Raffin, who specializes in unsolved crimes, concerning his second goal: unraveling the mystery surrounding Jacques Gaillard, a high-profile TV pundit who vanished ten years ago. Enzo feels an inexplicably strong bond with the eclectic Gaillard, whose passions were intellectual rather than carnal. The trail unfolds as a series of mini-mysteries, most with strong puzzle elements. Enzo confirms his hunch, through a DNA test of blood traces found on the altar of a church he frequented, that Gaillard was murdered. Then it’s time to reconstruct Gaillard’s skull from discovered fragments. As the case becomes more complicated and dangerous, Enzo’s elder daughter Sophie and Raffin’s estranged wife Charlotte, with whom Enzo becomes involved, get caught in the cross hairs. Raffin plays Watson to Enzo’s Holmes as they piece the tantalizing clues together. May (The Firemaker, 2005) provides abundant local color and writes with measured authority. The results are as engaging as they are cerebral.